Award winning residence at the Vancouver Roar One Point Grey homes for sale have been featured in numerous publications, features and newspaper articles. These luxurious Point Grey Roar One Vancouver condos are located in an exclusive neighbourhood that is unmatched, coupled with the highest level of design and architectural excellence. This doesn’t even include the luxurious interiors of these boutique Vancouver Roar One Residences that are situated in the heart of the prestigious Point Grey real estate district. This architectural master piece is located at 4387 West 10th Avenue, Vancouver and features some of the most unique and innovative residences in the heart of Point Grey real estate market. This architecturally designed concrete and glass Point Grey Roar One residence features dramatic yet very practical open spaces for you to enjoy the environment and community. Featuring beautiful iconic homes for professional couples or even families, this truly unique Point Grey Roar One Vancouver residence features soarking ceilings, floor to ceiling glass windows, terraces, balconies and pleny of other outdoor living spaces with views of the North Shore Mountains and the water. Spacious floor plans feature family rooms, large kitchens, spacious bedrooms and sumptuous bathrooms. The luxury Point Grey residences at Vancouver’s Roar One condos features polished, radiant heated concrete flooring, wenge cabinetry, karadon countertops and floor to ceiling aluminum sliding door system. This exceptional living space at 4387 West 10th Avenue Vancouver has been featured in numerous magazines and newspapers including: Architecture Magazine New York, The Globe and Mail, Vancouver Magazine, The Block Magazine and Fashion Magazine. In addition, the boutique Point Grey Roar One Vancouver condos were designed by LWPAC Lang Wilson Practise in Architecture Culture Inc. and Hotson Bakker Boniface Haden Associated Architects. The awards garnered by the Roar One Point Grey Vancouver luxury residence includes AIBC Innovation Award, Lieutenant Governor’s Medal – Award of Excellence and the 2008 Governor General’s Medal in Architecture that was presented on October 16, 2008 by Governor General Michaelle Jean at Rideau Hall in Ottawa. A married team of Cynthia Wilson and Oliver Lang created one of the most iconic masterpieces in Vancouver’s real estate architectural industry here at the Roar-one Point Grey residences. The primaries behind LWPAC – Lang Wilson Practise in Architecture Culture, the Point Grey Roar-one development is a stacked home design in the heart of Vancouver Westside and was designed in collaboration with the award winning team at Hotson Bakker Boniface Haden Architectures. Roar-one Vancouver condos was one of 3 winners of the 2005 Design Exchange awards for residential projects. 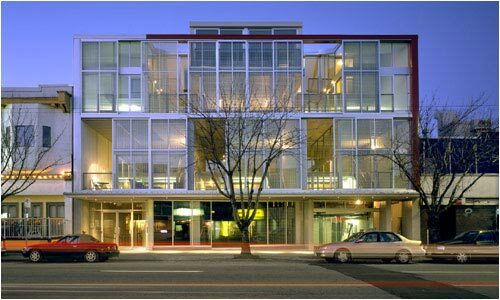 This truly unique residential building on West 10th Avenue features a front face of glass and slotted patios that are partially obscured by a fifteen foot high rectangle aluminum mesh, which moves around horizontally by residents in order to block out sunlight or let it in. This eliminates any nead for air conditioning within the suites. Once you get into the Point Grey Roar-one residences, you will be completely astonished, as the front entryway leads you into an open courtyard that is set between two 4 storey condo buildings. Lime green, concrete, basalt, Castillon bamboo and many other distinct features dot this outdoor lobby with tonnes of greenery and urban finishes. The stacked homes at the Vancouver Roar-one Point Grey residences feature a lot of glass, windows that open at opposing ends, and spacious exposed balconies and patios for every floor plan. There are a total of only 10 boutique Vancouver condos at the Roar-one Point Grey residences and they range in size between eight hundred to two thousand square feet with loft style mezzanines and ceilings up to sixteen feet tall, leading to bright and contemporary living spaces. The developer for the Roar-one Point Grey Vancouver luxury condos was Sergio Rodriguez. As with the movable panels, there are six to eight different configurations that allow different amounts of light into your suite and into the building, making it a great way to showcase a truly organic apartment building. The sky homes at the luxury Point Grey Roar-one Residences feature sliding doors that open on either side of the inset sundeck dividing the main floor, and making the single inside/outside room that circulates fresh air and allows pleny of light into your home. The suites feel more like homes than they do condos. The Vancouver Roar-one condo building won many awards for its innovative and unique architectural and interior design. The collaboration between Lang Wilson Practise in Architecture Culture and Hotson Bakker Boniface Haden Associated Architects meant that the Roar-one Point Grey luxury condos was sure to win many design and architecture awards for this truly innovative, fun, exciting and fresh residential building. The engineering team included Fast + Epp, Stantec, Marceau Evans Johnson and Pioneer while the general contractor was the Haebler Group. The cost of the construction of the luxury Point Grey Roar-one residences was approximately $3.6M. The penthouse suite at the Roar-one Point Grey condominiums featured by Hasman was a three bedroom and three bath unit that was completed in 2006. The Roar-one penthouse suite is 1657 square feet in size and the estimated 2007 taxes was approximately $4800. There are only a total of 10 suites at this luxury Point Grey condo building.